Today was a rare thing in these parts….a sunny day! Well it was until 4pm when it started to thunder and pour with rain. However, it was a well needed weekend opportunity to have a good tidy in the garden. Plus I still have flowers in the greenhouse which should have been planted out months ago. (They are still there after rain stopped play!). Every year I always have big plans for the border underneath the kitchen window. This year was no different. It was going to be a swathe of chrysanthemums, asters, clarkia, cornflowers and any other cut flower I could get my hands on. With everything else to do I just never got round to it. I did plant some chrysanthemum seeds but I think Dennis dug them up before they had a chance to germinate. I just left it and pulled out the odd weed every time I walked past. 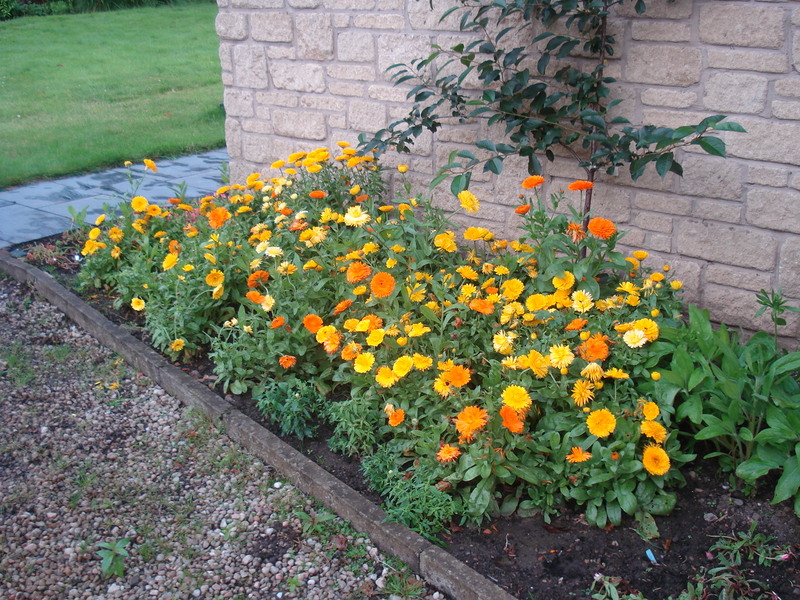 Last year I planted calendula in this border and look what happened! 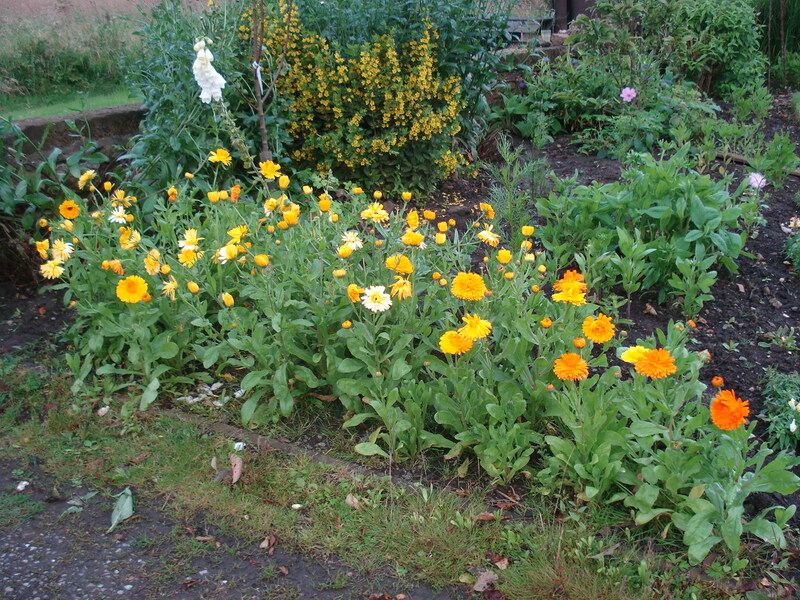 They self-seeded and have virtually taken up the whole border. They same thing has also happened at the gate. I have not had even a fraction of this success with the flowers I have grown from seed this year. I also felt bad about neglecting my herbs. Watering was erratic and most of them went to seed. However, in the case of coriander this is a good thing. 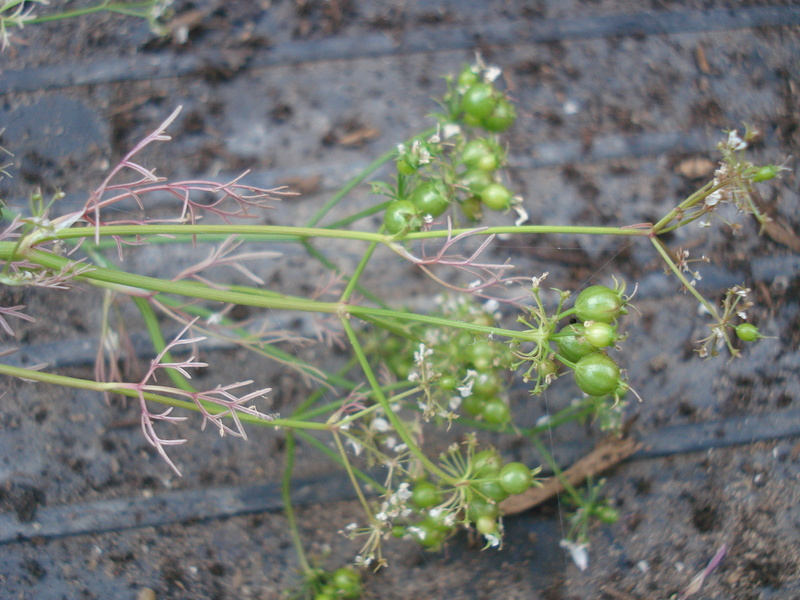 I now have loads of coriander seeds for cooking with. Result! So maybe the secret to success in the garden is just do nothing at all! …..do you think it would have looked like this? Gardeners in the UK will relate to my plight. For those elsewhere in the world, this is not just another Brit moaning about the weather. Record after record has been broken since April and today was just one downpour too far for my already waterlogged garden. There has been so much rain that I have not needed to water any plants outside since May! 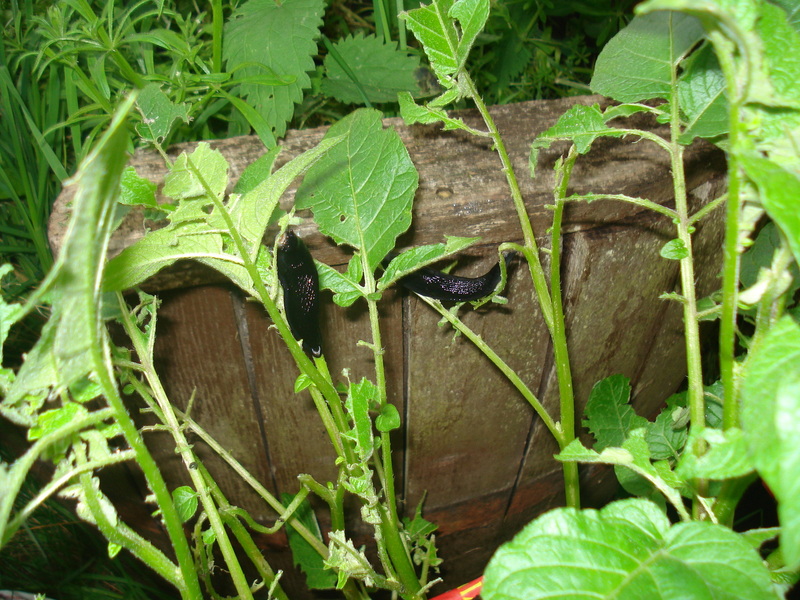 After this afternoon’s deluge, what the slugs had not eaten has been washed away. Underneath the water in the photo are livingstone daisies, snap dragons and california poppies. Apparently it is all down to the jet stream being in the wrong place but if you are to believe the weather forecasters it is on its way back to where it should be and things should be back to normal soon. For central Scotland that means humid drizzle and frizzy hair! 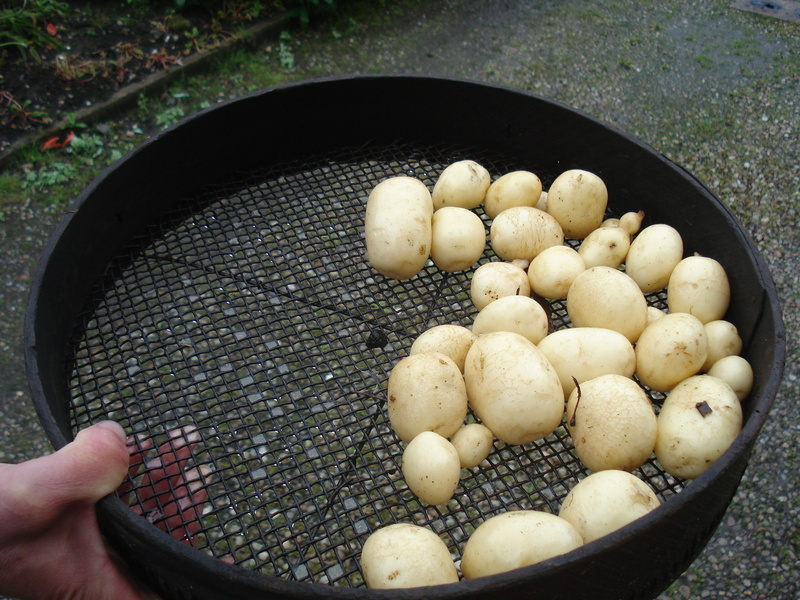 On the plus side we have harvested and eaten the first early potatoes. Having read the books, when first earlies flower, that is the time to dig them up. However, we waited and waited and they never flowered. The stems went yellow and fell over so we decided to see what was underneath. 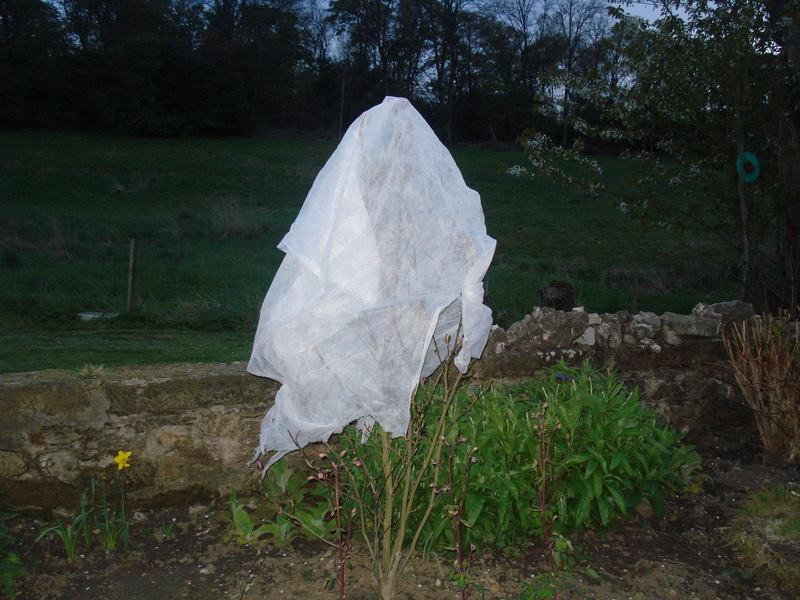 The main crop tatties are in bags in the garden and are currently being decimated by slugs….but that’s a whole other blog, dear readers! 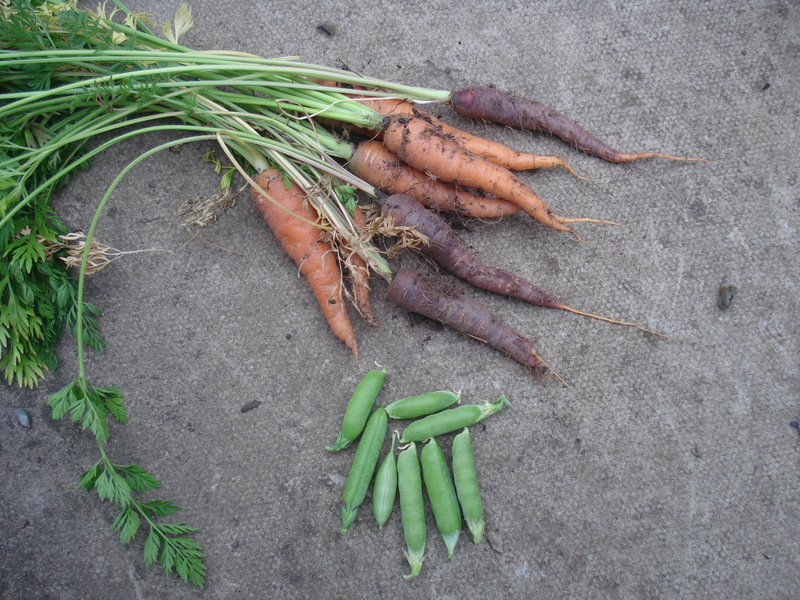 My experiment to have early carrots and petit pois worked and both crops have been eated and frozen respectively. Unfortunately, the second lot of carrot seeds I planted seemed to stop growing when they got to about 1cm high and as I have not got round to planting some more I now find myself having a bit of a carrot shortage. 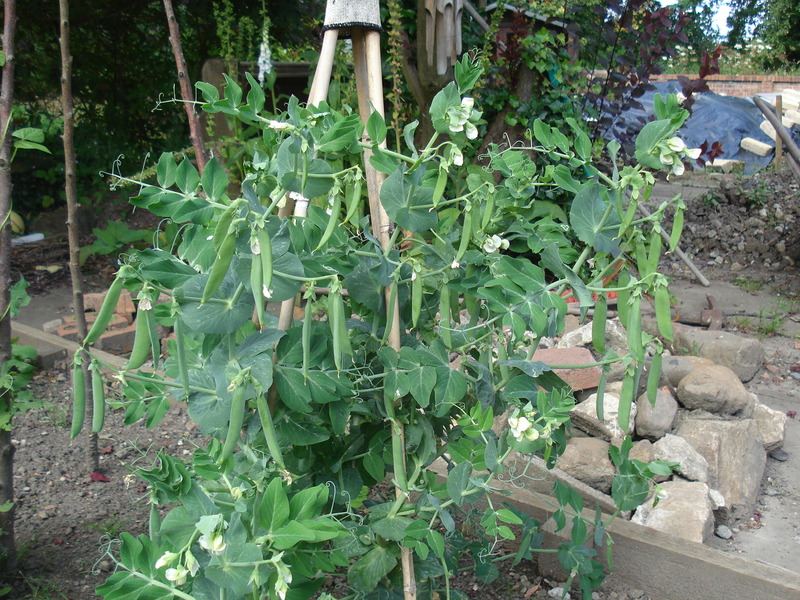 The peas outside are flowering so hopefully there should be more of them soon. 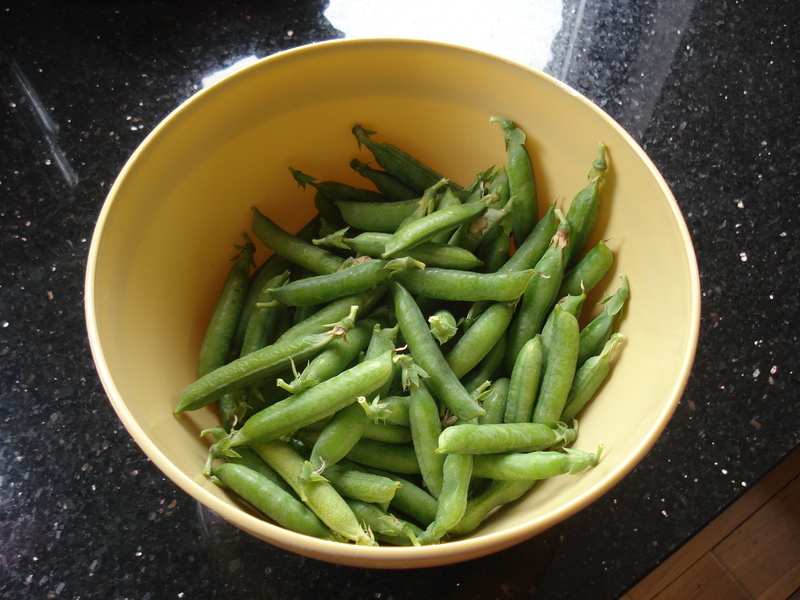 The spinach and pak choi were great but lack of maintenance meant they went to seed before we could eat it all. 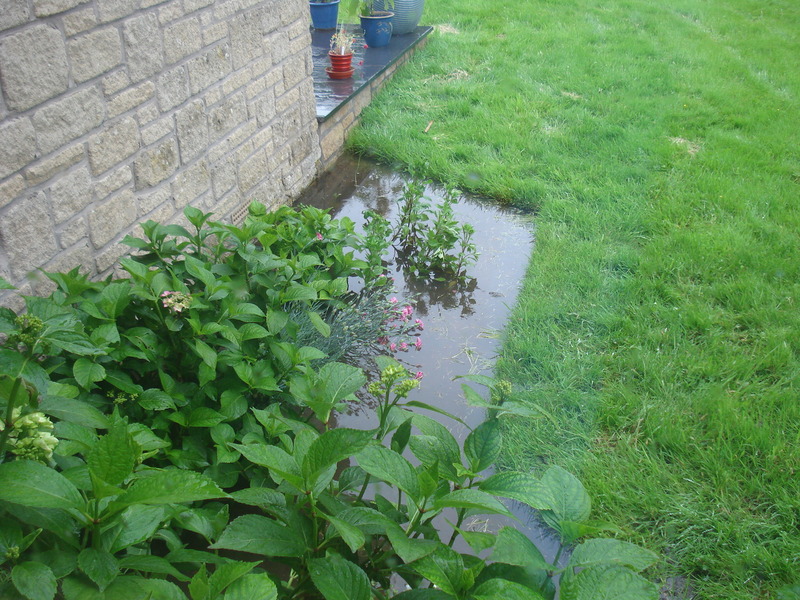 Outside we have started to pick raspberries but as I write, the strawberries are under water! 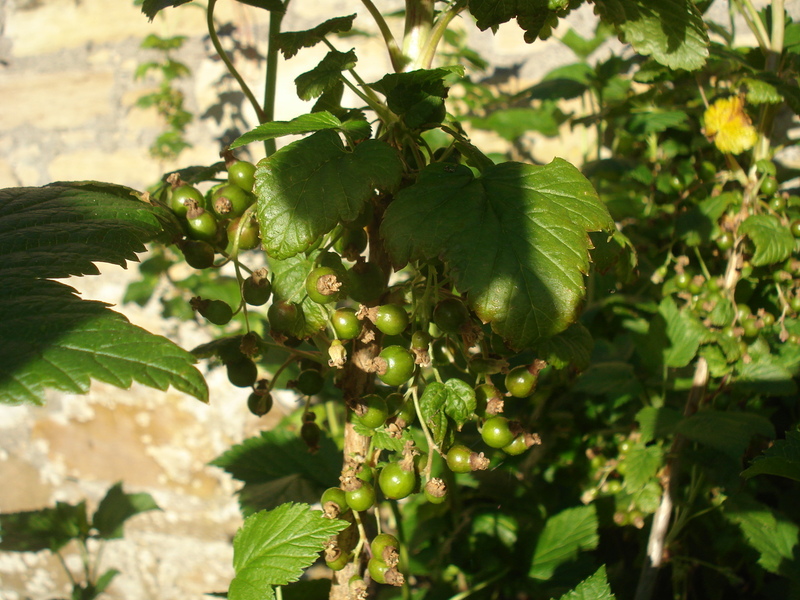 The blackcurrants and gooseberries should be ready for picking this weekend – jamtastic! 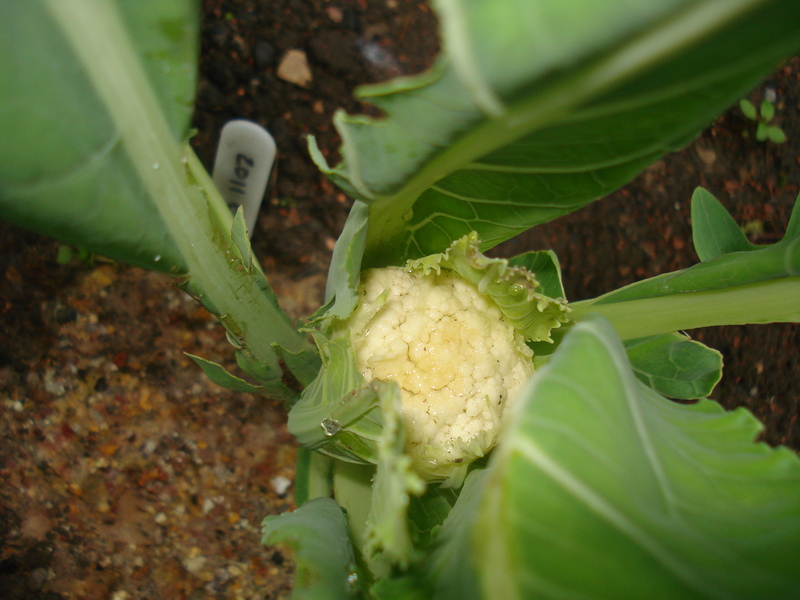 My first head of cauliflower has formed and there have been some small spears of brocolli. I need to research how you are supposed to pick grow brocolli because mine just seems to flower immediately before an actual head forms. It’s tasty all the same. If anyone can help, please tell me where I am going wrong. And finally, I have three tomatoes! In recent years we always started eating tomatoes around mid-June. Now we are half-way through July and look at how far behind we are. 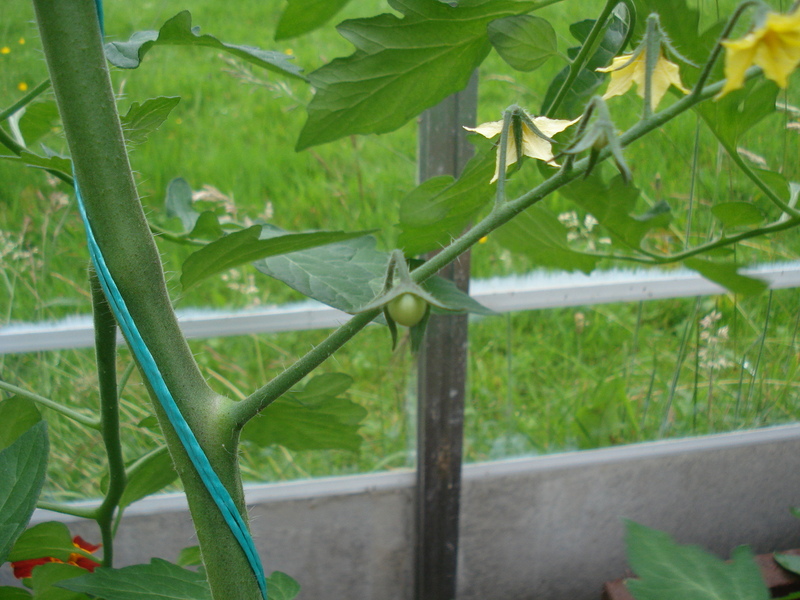 I am looking forward to my first roast cherry tomato and spaghetti supper. So sang Dinah Washington, The Temptations, Jamie Cullum, Tony Bennett and all day yesterday, me! Yes the sun was shining and I embarked on my flower planting marathon which will continue all weekend and probably well into next week. I am keeping a note of how many of each flower I am planting and I think you will all be truly impressed! 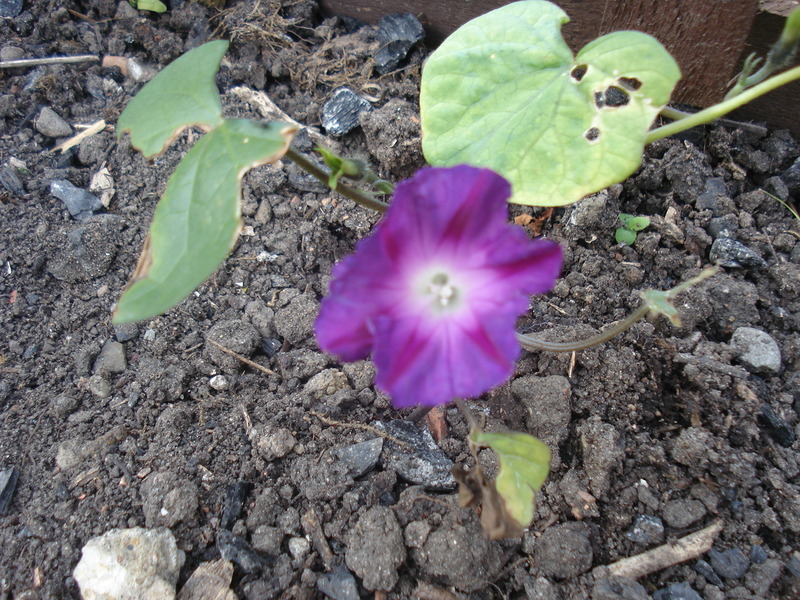 However, the reason I am blogging about a day making a difference is that my Jekyll and Hyde personalities (ie my legal brain and my common sense brain) have been wrestling with each other this week about, would you believe, the timing of sowing seeds. I was passing the garden centre on Wednesday (30 May) and popped in to check there was nothing else I could grow this summer and also to pick up some winter flowering pansy seeds which I read should be sown around now. I have been reading lots of other gardening blogs and recently many people were talking about harvesting purple sprouting broccoli which had been over-wintered. I thought I would give it a try and looked for the seeds. 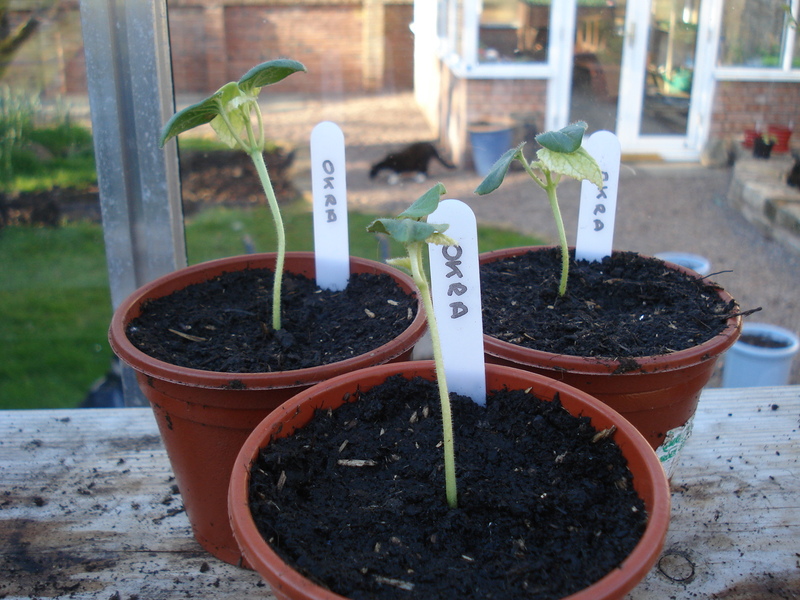 There were lots to choose from but when reading the instructions a common theme was developing… “sow April to May”. That only left me one more day! You see this is where my mental tussle began. To my legal brain, used to 20 years of sticking to time limits and deadlines, I only had until midnight on 31 May to sow these seeds. Thursday 31 May dawned. It was so wet, even the slugs had umbrellas. I checked the weather forecast. It was due to dry up around 4pm. Perfect, still plenty of time. 4pm came and went and it was still torrential, getting even heavier. The fire, the lights and the television went on. I kept wandering over to the window and gazing out. No change. Eventually, Mr Mac asked what was wrong with me. 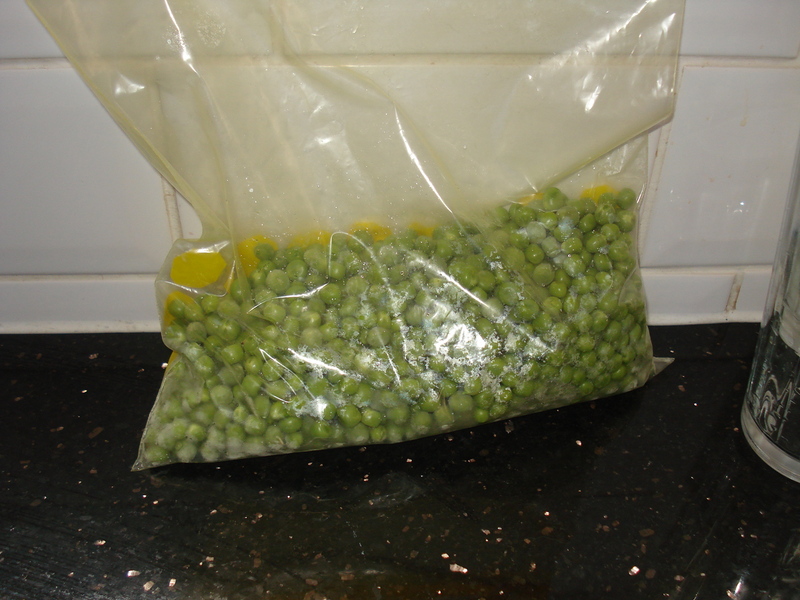 I told him I only had until midnight to sow my purple sprouting broccoli seeds. As soon as the words were out of my mouth I realised how totally stupid they sounded. My legal brain had clocked off for the evening and common sense brain was on the backshift – they just hadn’t told me. Anyway, I can’t publish Mr Mac’s response but it was along the lines of “don’t be so silly, darling, one more day won’t make a difference”. This is from the man who believes sell by dates are a conspiracy and is often heard muttering at an open fridge, “it says ‘best before’, not ‘will kill you’ after”. So yesterday, Friday 1 June was a beautiful sunny day and guess what? I still didn’t sow my purple sprouting broccoli seeds. I was so busy trying to catch up with flower planting I did not get round to it. Why do today what you can put off until tomorrow? (That’s the Irish side of my family!). “Plants from a March sowing can be in flower as early as late May, but, of course, we’re into June now and we’ve missed the sowing deadline for summer flowers this year”. 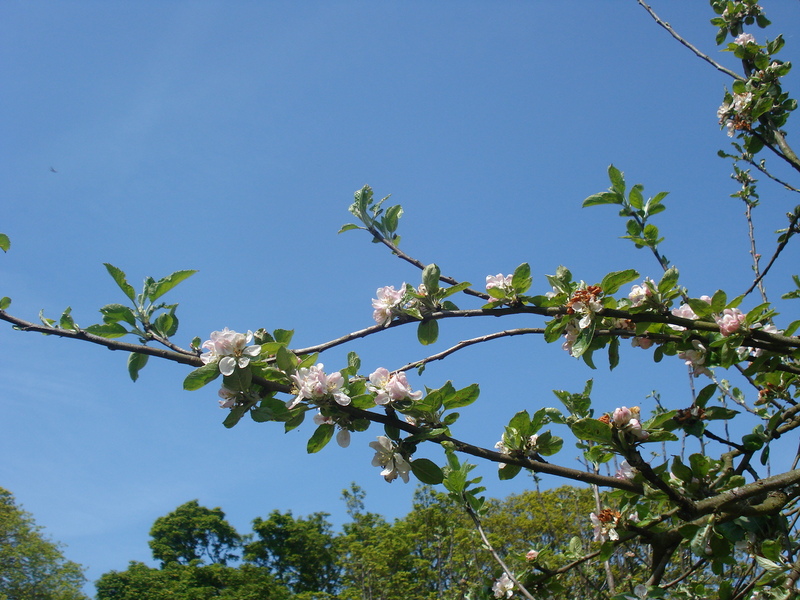 Gardeners should remember to look up! Gardeners tend to wander around looking down most of the time. There is nothing wrong with that. Most of what we are interested in is in the ground so our eyes are mostly diverted down the way. 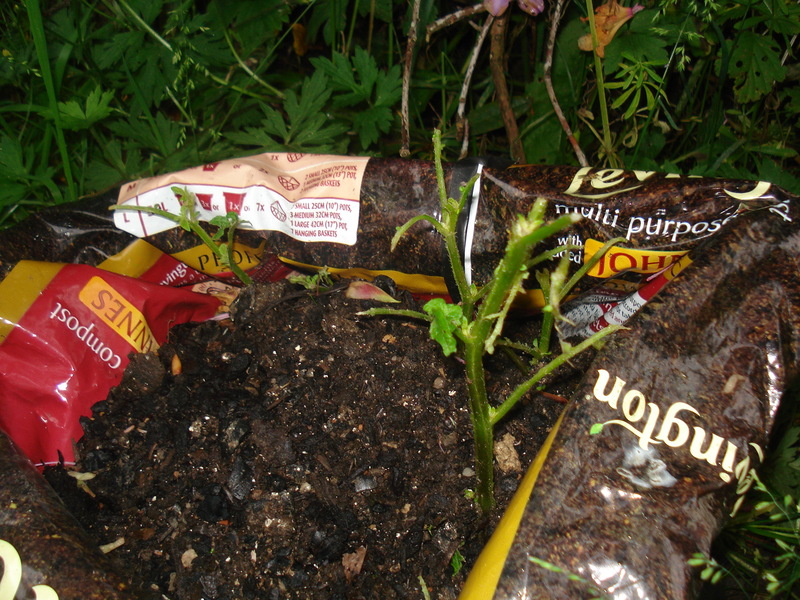 The other day I was wrestling with a big root I came across when loosening some soil for planting. After playing tug-o-war, the root won and I ended up flying through the air and landed on my back in the grass. I lay there for a few seconds not knowing whether to laugh or cry and then I noticed the leaves on the big lime tree were just about fully open, but not quite. 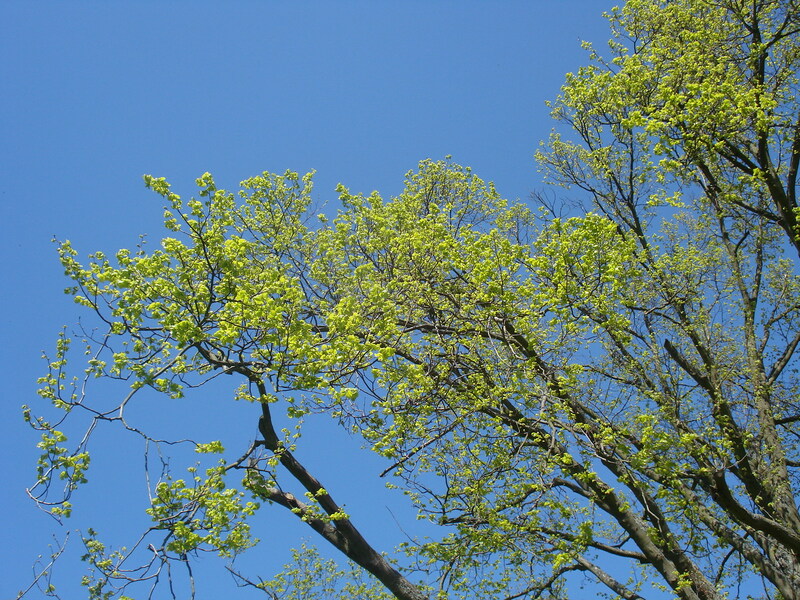 It was a lovely sunny day and the contrast of the lime green of the leaves against the sunny blue sky was quite stunning. Don’t worry I’m not going all Wordsworth on you. Cloudless, sunny blue skies are something of a rarity round here. So I went and got the camera, had a wander round the garden and took some pictures of the things above that we forget are there. 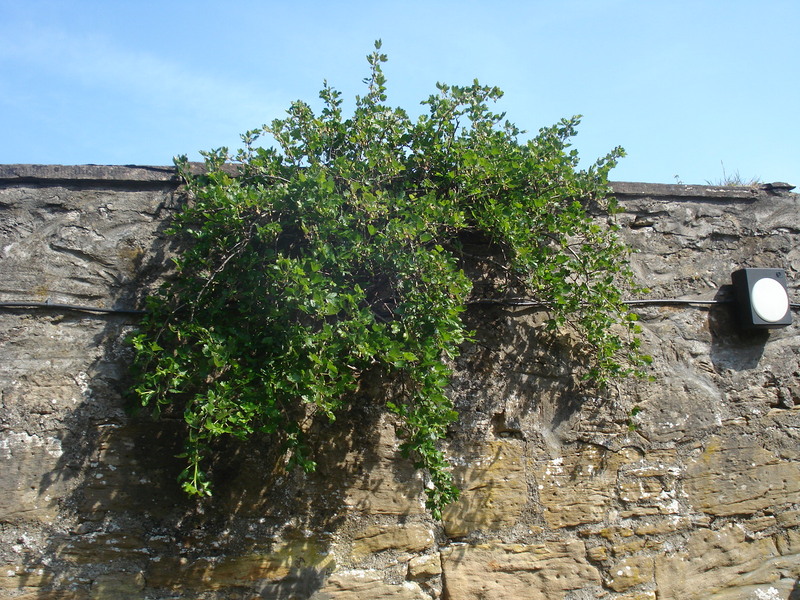 This gooseberry bush grows out of the top of the wall and we forget it is there until the fruit is ready to pick. From this one little bush we have had as much as 13lbs of gooseberry jam! 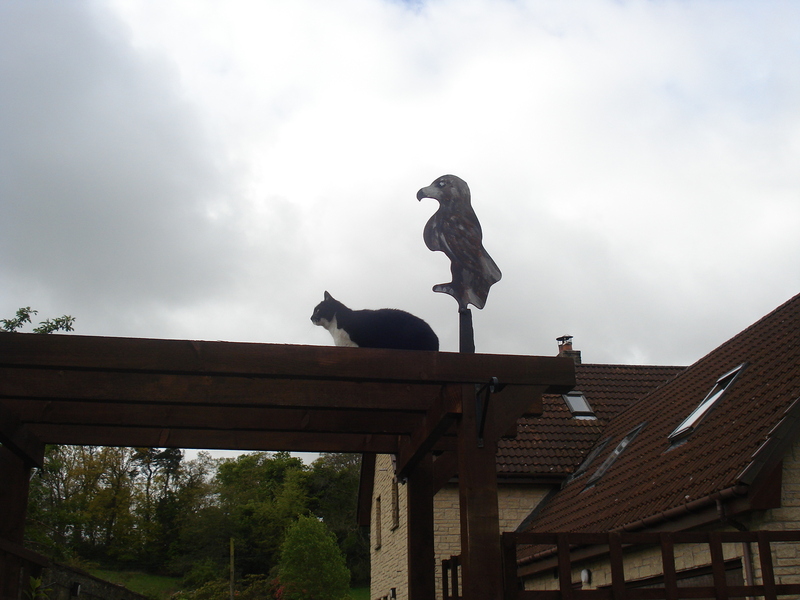 Dennis does his impression of Eddie the Eagle! Well after everything being really slow to get growing, the hot sunny weather last week brought everyting out at once. It has totally transformed the garden. 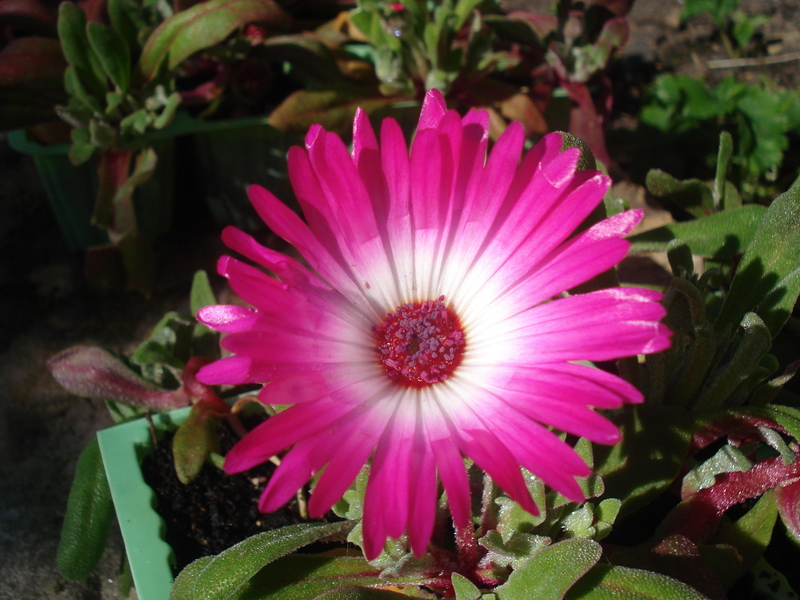 My first Livingstone Daisy – and it’s a pink one! 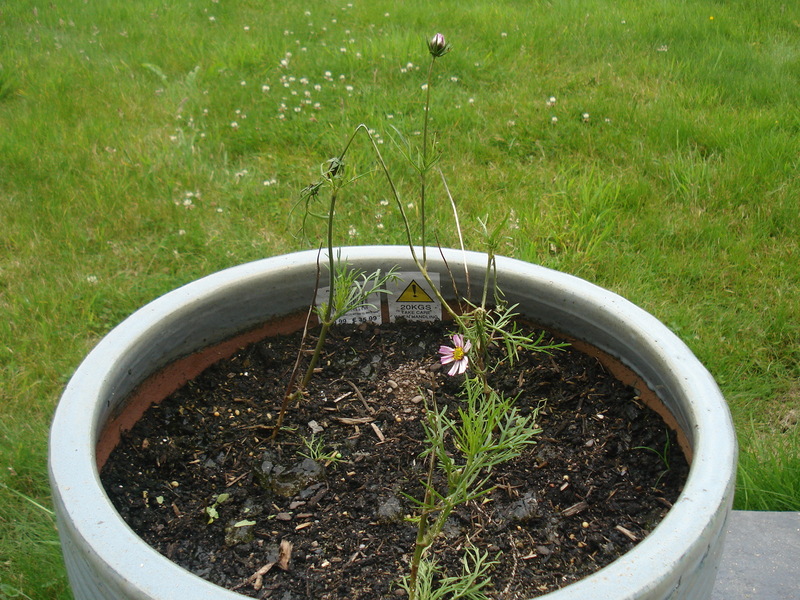 The Cosmos started to flower before I even got them planted in the garden. 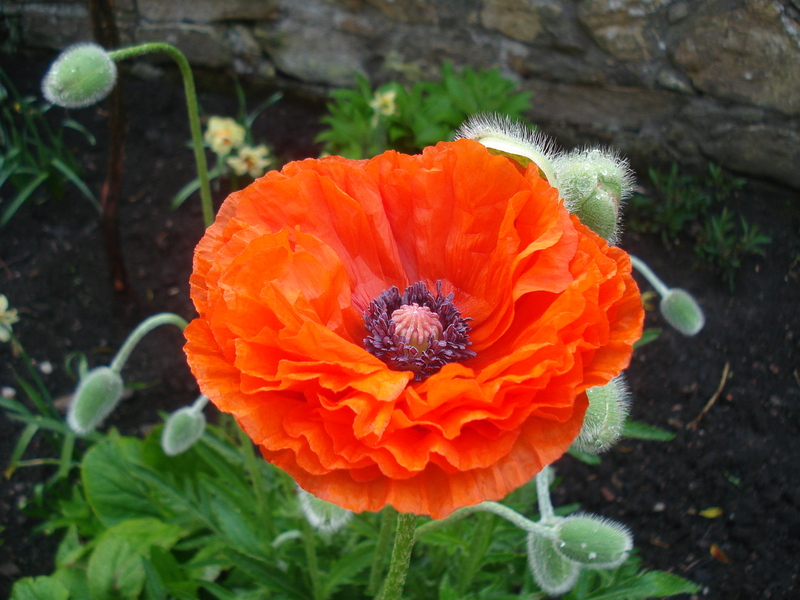 Oriental Poppy. I got up one morning, put the kettle on, looked out of the window and there it was! There are lots out now but it is raining today which means they are all falling over because, despite my earlier blog promise, I did not put in supports for them! 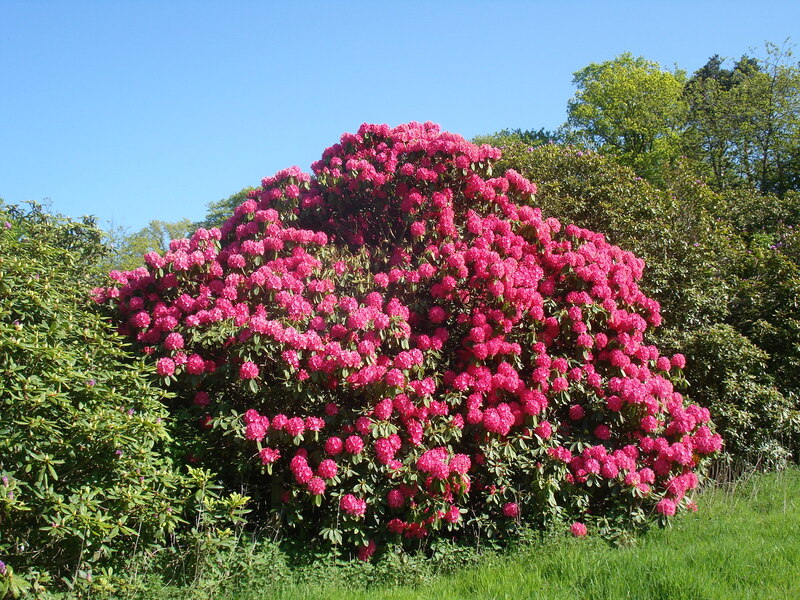 We have a small track into our house and the last part is lined with rhodedendron bushes. This is the first one to flower this year. Normally they would have finished flowering by now. 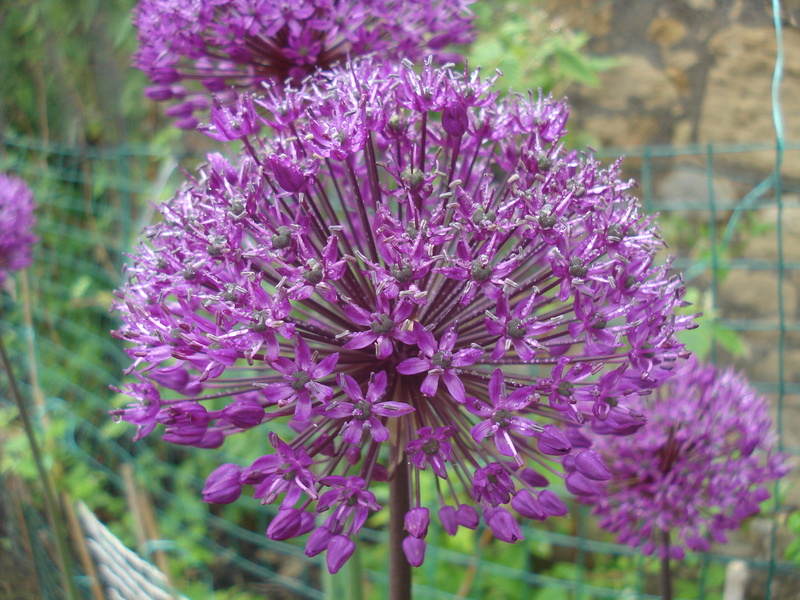 These are allium bulbs we planted in a pot last year. The pot was lying outside the greenhouse and we thought it was empty – so this was a nice surprise. We will definitely plant the bulbs in the ground this year after they have finished flowering. 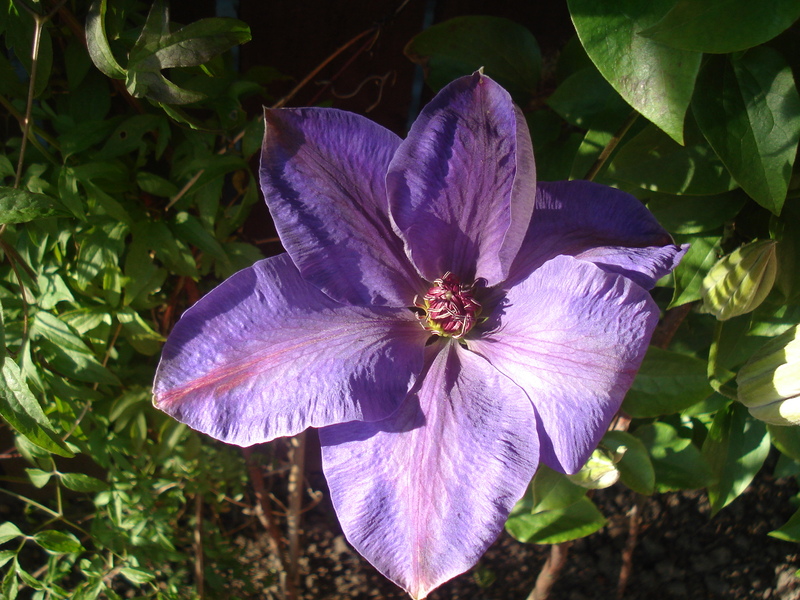 This clemetis was bought 2 years ago from a discount store and it has never failed to produce giant purple flowers. Not bad for 99p! Mr Mac’s blackcurrants. We can look forward to lots of blackcurrant jam, provided we can keep the birds and whitefly away! 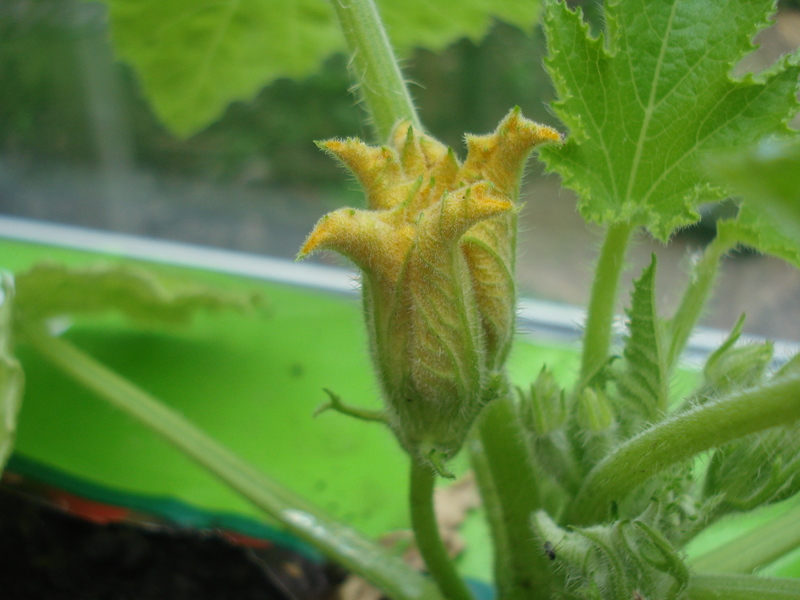 I was not convinced this courgette plant was still alive but then it produced this flower. 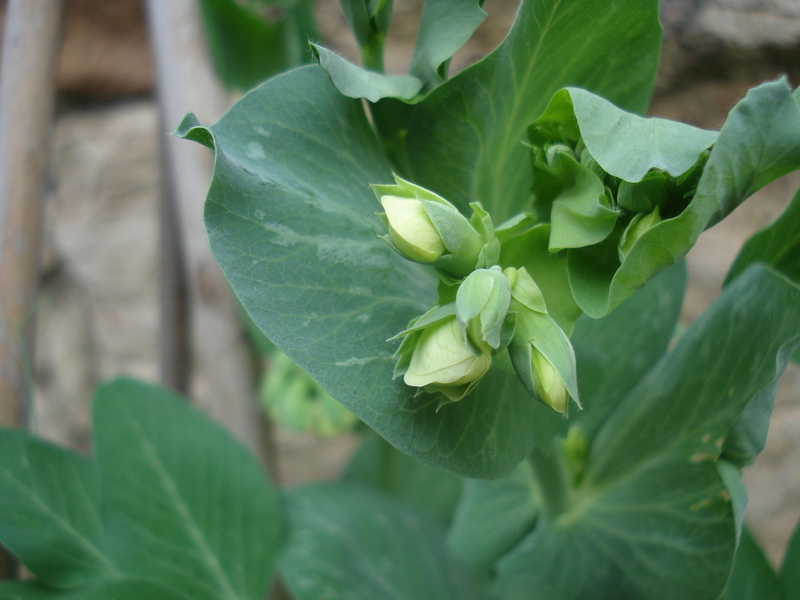 OK I realise this pea flower is not quite open but it will be by tomorrow! 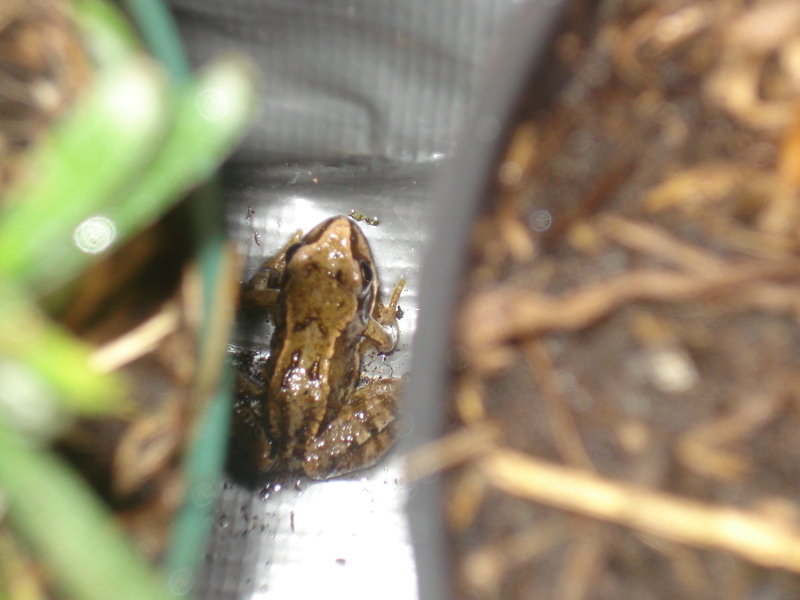 Kermit was hibernating in the lavender of all places. 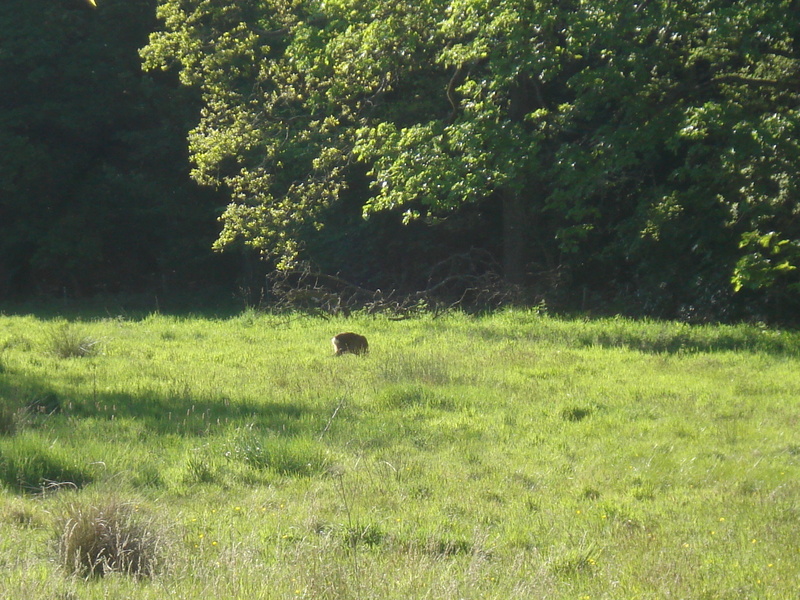 The brown blob you can see is a 3 week old fawn. Unfortunately my camera could not zoom close enough to pick out the white spots. We knew it had been born but only saw it for the first time at the weekend. It’s mother is just behind the bushes to the left of the picture. They were grazing beside our garden all afternoon. And finally, a little self-indulgent story. The first time my grandmother came to see our new house the first thing she said when she got out of the car was, “You can plant me a magnolia tree. I’ve always wanted one”. We had nowhere to put one but she kept asking us and asking us when she could get one so we could plant it for her. Finally, last year we removed a hug laurel bush at the gate and started researching the type of tree that would be best suited for that spot. 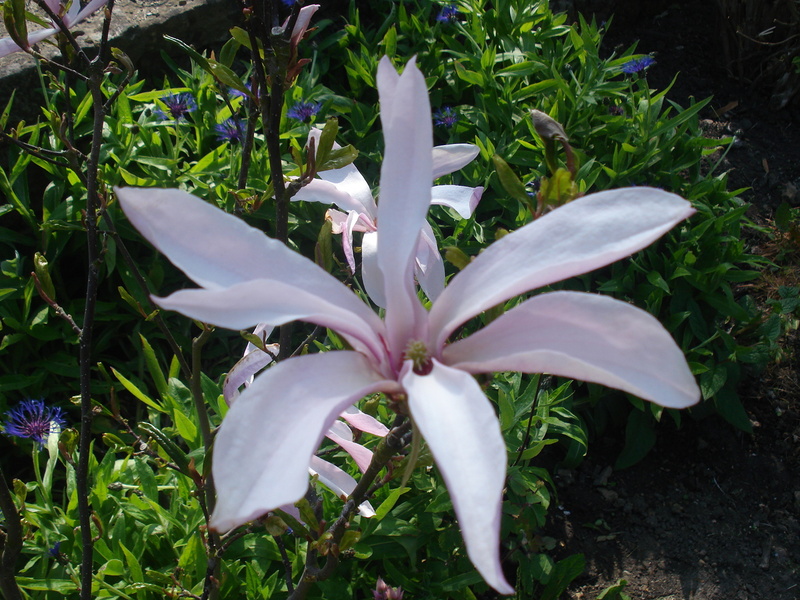 Magnolia Susan was the one. Tolerant of cold and wind – this is Scotland remember! The tree was purchased and planted. A few of the giant pink flowers came out and my gran was thrilled when she saw them. 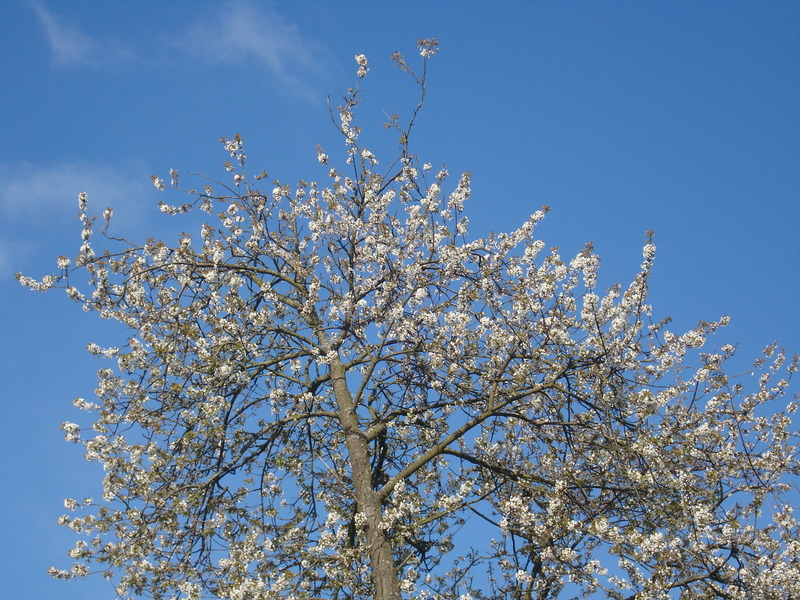 This is the first year the tree has flowered fully and sadly my gran died at Christmas time so she never saw it. Even when she was in hospital she asked if her tree had survived the hurricane we had a few days earlier. She is no longer with us but I hope she can see her tree from heaven. It feels as if nothing is really growing but I have just looked at some photographs taken a month ago and there has been some movement…but not nearly as much as there should have been. It is as if time has stopped. I should have my tomato plants in growbags by now. 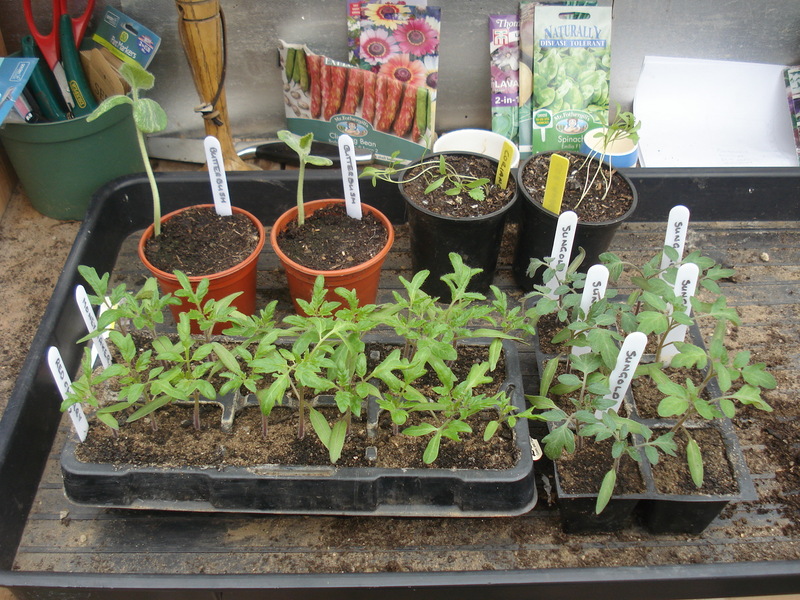 I am only growing three varieties this year, moneymaker, red cherry and sungold. These are the ones I always have most success with. I was having a bit of blogger banter with fellow gardening blogger Adam Leone (see Carrot Tops Allotment http://carrottopsallotment.com/) about the tastiest cherry tomato. He reckoned Gardeners Delight is the best variety but I think sungold is just that bit better. Put it this way, last year very few of our sungold tomatoes made it as far as the kitchen. In fact, very few made it out of the greenhouse. They were so sweet we ate them like sweeties. So I set Adam a challenge. Grow both varieties and then do a blind tasting to see which one he prefers. 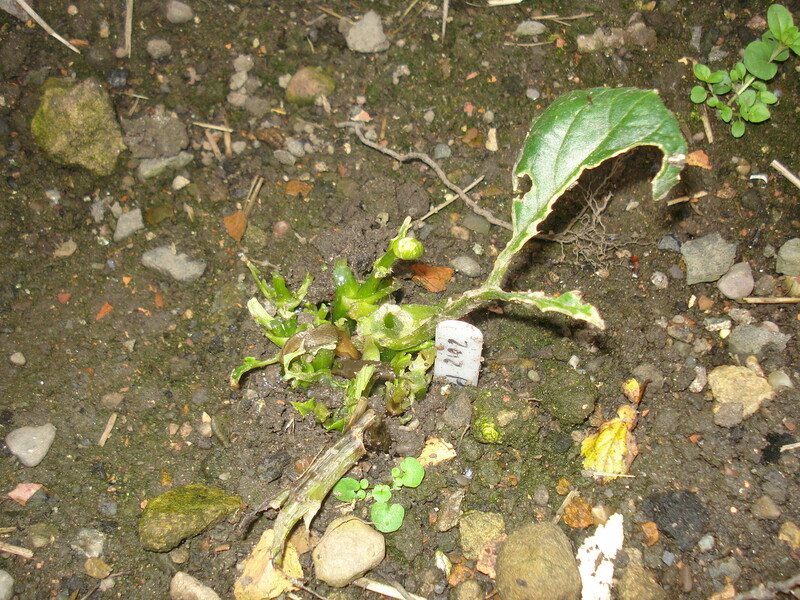 He has even gone as far as mention my challenge in his last podcast and he has planted his sungold seeds – so the challenge is on! All we need now is some sunshine! This week I managed to plant swedes and Florence fennel outside. 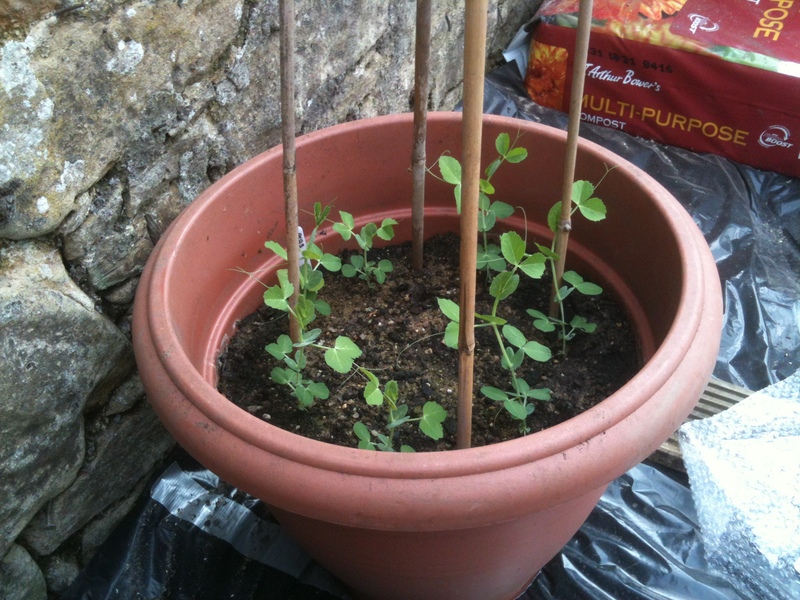 The beetroot and peas I planted outside a couple of weeks ago have germinated which is good news. 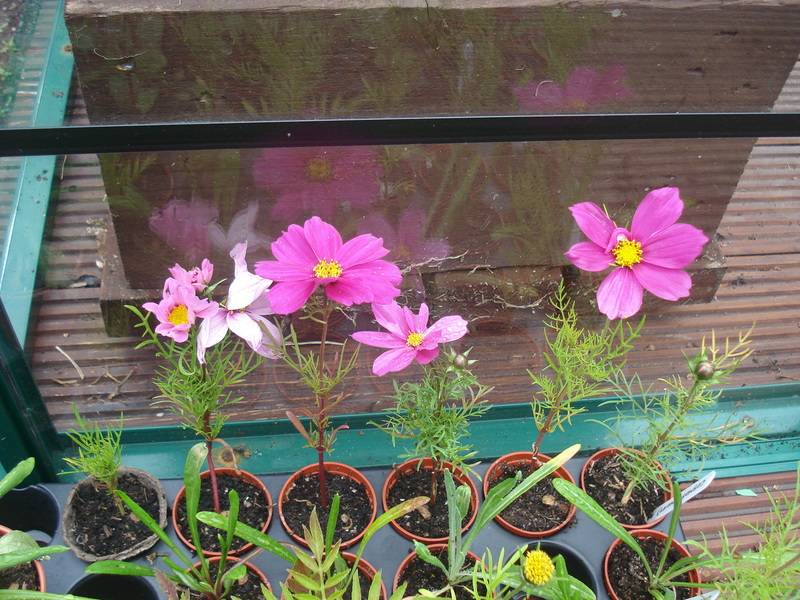 I have potted on some zinnias, cosmos and diascia. The flowers and brassicas are all hardening off nicely. It has certainly been the perfect hardening off weather! The brassicas could really do with being planted out now but we dug over the plot two weeks ago and normally we would have expected the clods of earth to have dried enough to crumble when stamped on. 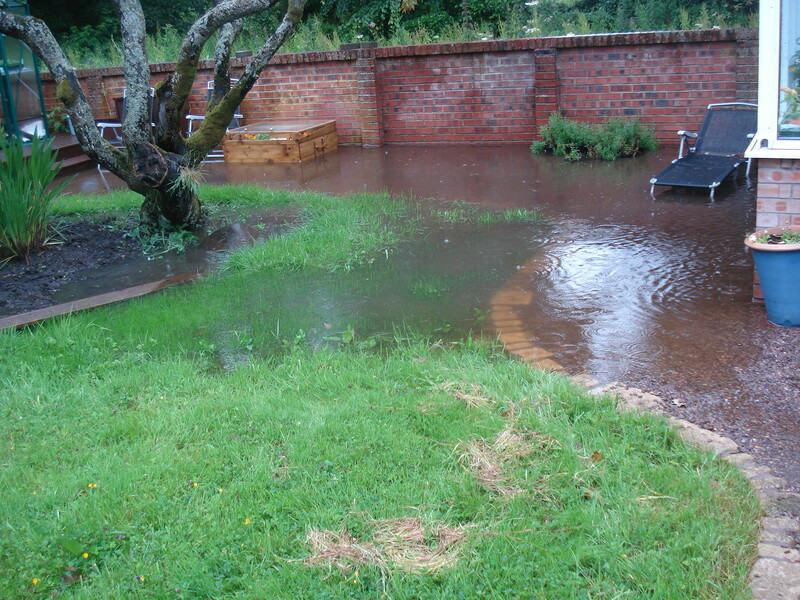 However, it has never stopped raining long enough and so I am unable to get the patch prepared for planting! The brassica patch is not quite ready! My sweet peas have been ready to go out for weeks and they have become really straggly and unsightly…so I sowed some more. 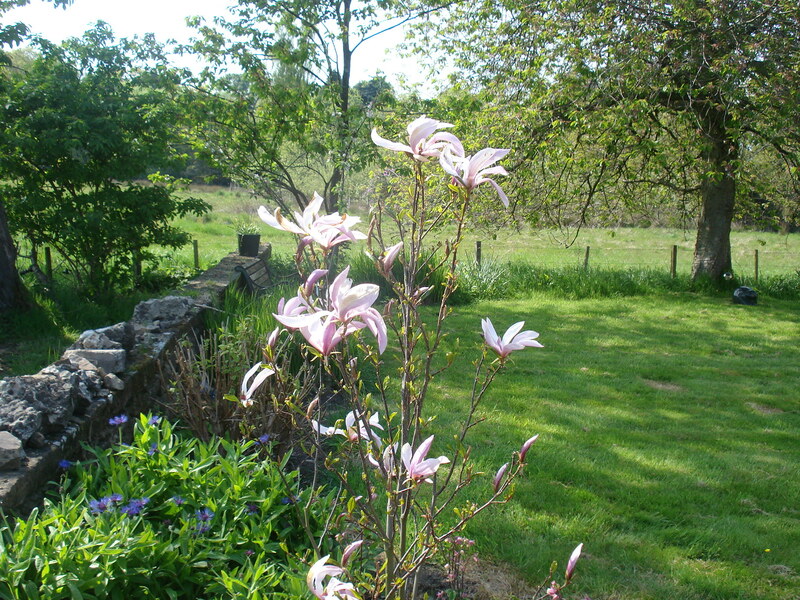 My gran’s magnolia tree is about to flower but we have had to cover it with fleece a few nights when frost was forecast. I lost a melon and courgette plant, so only have one of each left. I have planted some more seeds just in case. 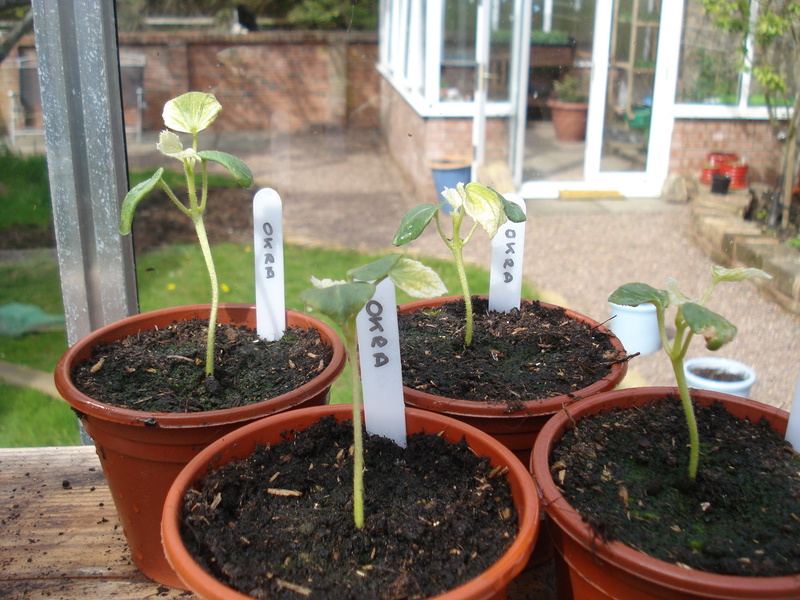 The good news is the peas, livingstone daisies, sunflowers, potatoes, blueberry, carrots and pak choi are thriving in the greenhouse and the strawberry plants outside have started to flower! My 4 okra plants seem to be in the land that time forgot. 18 May 2012 – spot the difference! 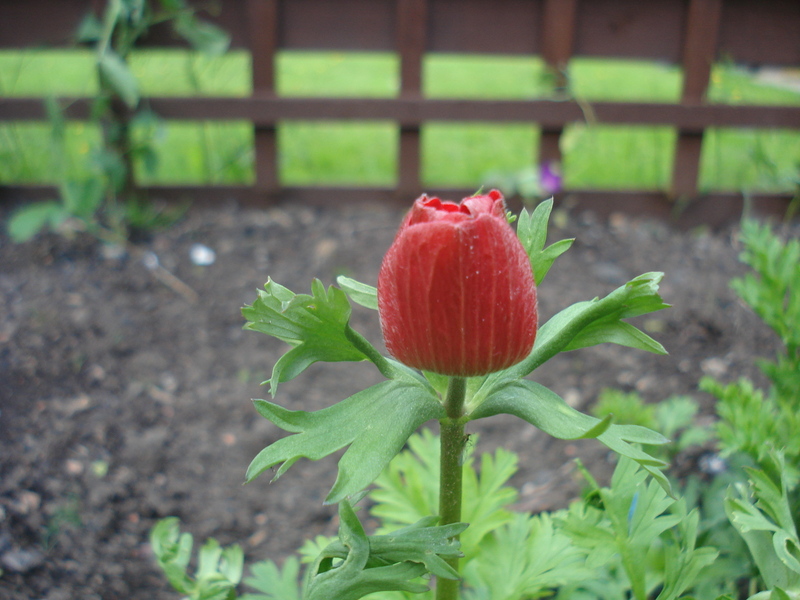 I have not been able to sow any seeds for cut flowers outside, something new I wanted to try this year. So I have just planted up some large pots and left them in the greenhouse until things warm up. Every garden related publication I read at the moment seems to be full of hints and tips for keeping cats out of gardens. I never realised there was so much animosity from gardeners towards our little furry friends. If only this was possible! 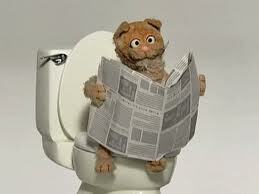 The main issue seems to be poop and the health risks to humans. Contact with cat poop can be a serious health hazard to pregnant women due to the presence of toxoplasmosis. 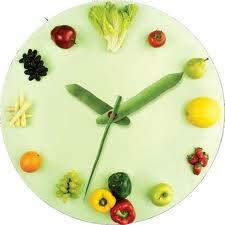 Poop should be kept away from compost and also vegetables destined for human consumption. The digging necessary to hide the poop can also disrupt and damage seedlings and flower beds. But are cats getting a bad press? When I trained to become a lawyer, my vision was one of courtroom dramas, wigs and gowns, fighting injustices and righting wrongs done to my fellow human beings. It soon became very apparent that I could not argue my way out of a paper bag so I turned my back on dreams of a Nobel Peace Prize for justice and became a property lawyer! However, for once I am prepared to stick my neck out, get off the fence and make a case for the defence of my little furry friends. I do have to admit I am slightly biased in their favour, being the owner of two. Playing devil’s advoCAT (sorry! ), yes the outdoor toileting can be a bit of an issue. The clumps of earth that are not clumps of earth at all are my pet hate. Dennis the Menace, the youngest, feels compelled to mark his territory every time any earth has been remotely disturbed, let alone dug (when he is totally beside himself and does not know where to park his bum first!). 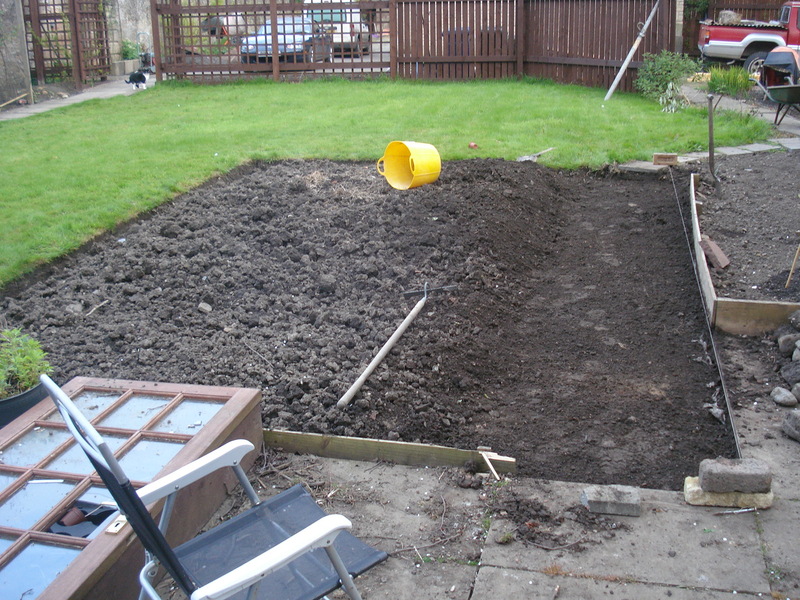 Once we were filling a wheelbarrow with soil, turned around and there was Dennis doing the toilet in the wheelbarrow. We have had cats rolling around in between the onions, inevitably breaking some stems and playing football with seed potatoes that they have managed to dig up. All these things can be overcome. I always wear gloves in the garden, mainly because I’m a girl but it means you don’t touch anything you shouldn’t. 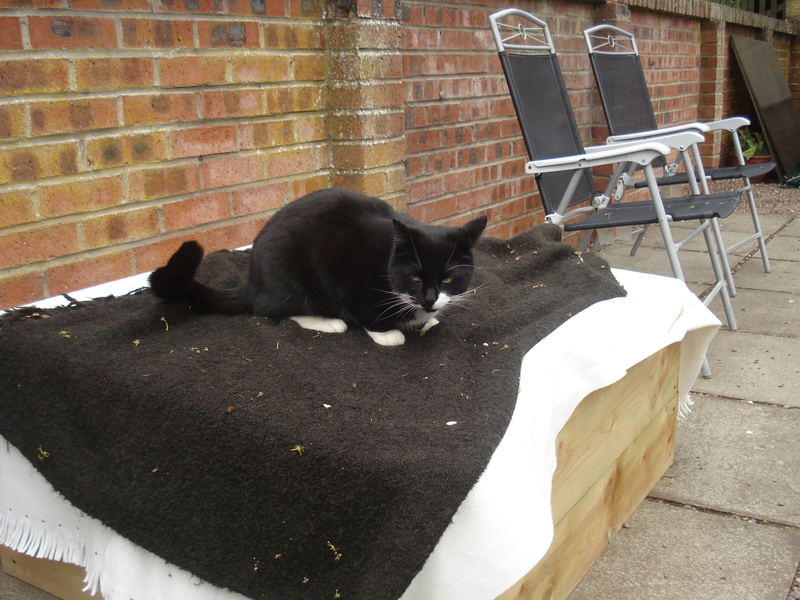 It is quite easy to keep cats off veggie patches by using twigs and sticks which make it hard for them to get in, roll about or dig. 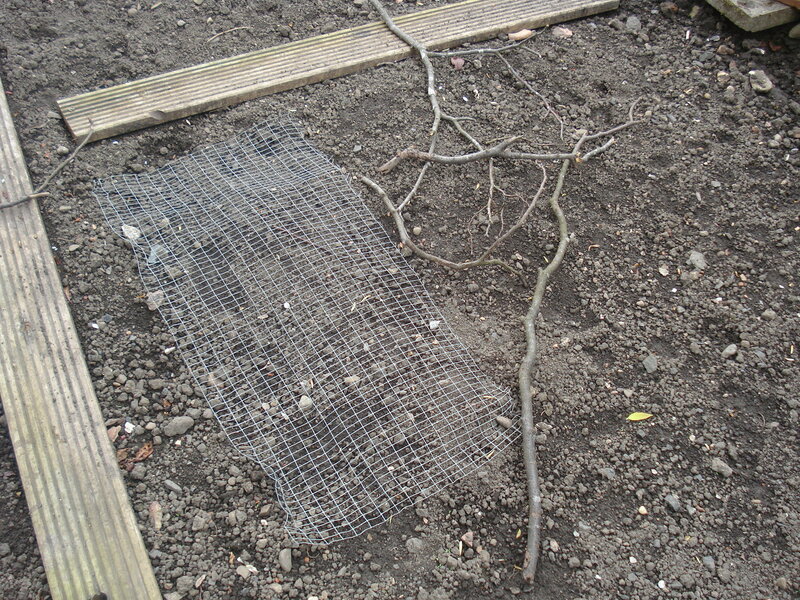 Seeds and seedlings can be protected by covering them with netting of some kind which prohibits cats from digging them up, allowing successful germination. 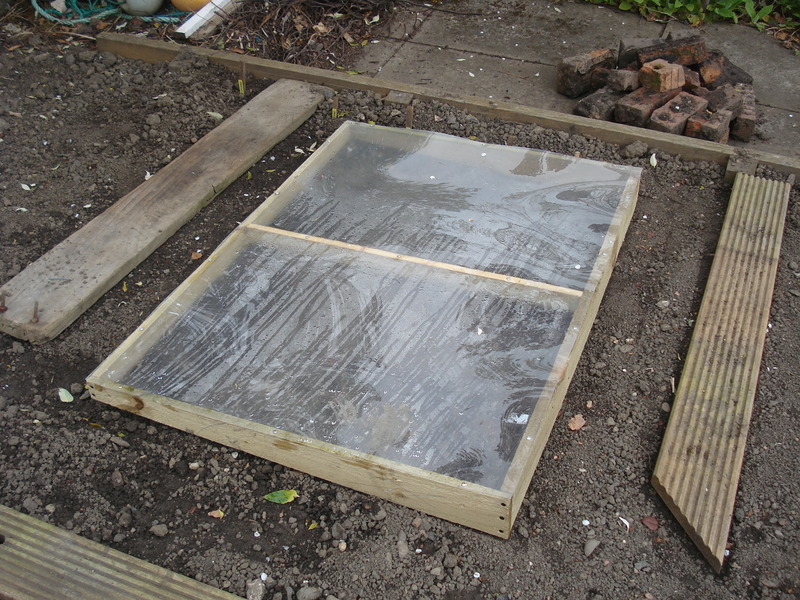 Last week I discovered the rows of beetroot seeds I had planted had been disturbed so Mr Mac made a cover from clear plastic and some wood to place over the seeds until they have germinated. My beetroot seeds will at least get a chance to germinate. So will my parsnip seeds. 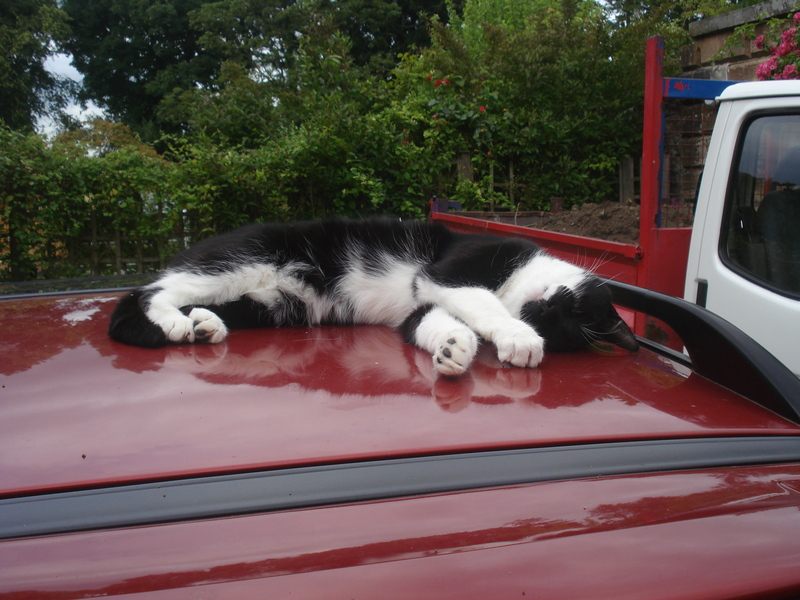 It is common sense really and I would argue that the benefits of having cats in the garden far outweigh the disadvantages. 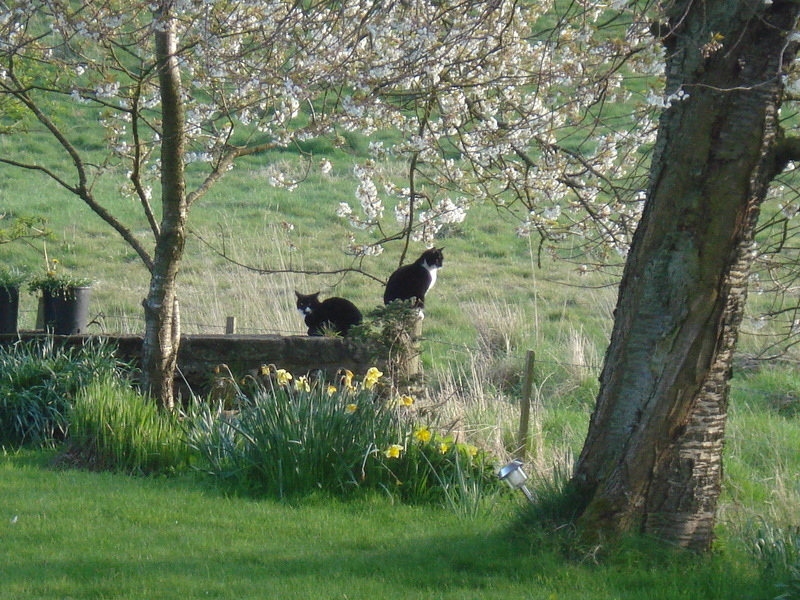 When we moved here 4 years ago, almost every surface in the garden was covered in rabbit droppings. Rabbits are indiscriminate in the destruction of a garden. Rabbits find most of their favourite foods in the vegetable garden. They will also munch flowers and chew the bark, buds and stems of woody plants. We no longer have a problem with rabbits. Neither does our neighbour who used to be overrun with rabbits and squirrels. He goes out of his way to encourage our cats to hang around his garden. Mice are also notorious for eating seedlings. 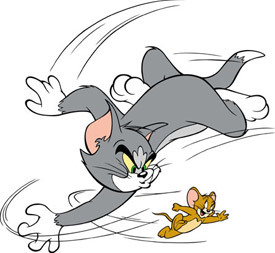 The only problem we now have with mice is when they are brought to us as a gift! Our boys are the ultimate in biological pest control taking care of rabbits, mice, birds, squirrels, a weasel (I had to look it up in a book because I had never seen one) and, best of all, moles. As soon as we have a mole hill on the lawn, we sit Dennis on top of it, let him have a sniff and soon after, one dead mole. So, admittedly we do suffer the occasional loss from having cats in the garden but we are more than prepared to live with it. I would much rather lose one or two seedlings because they have been disturbed by a cat than lose a whole crop to rabbits and mice.